Dear people of good will, we need your support! More efforts to ban the sharing of meals with the hungry. Many tens of thousands of Americans are struggling to survive yet we are witnessing a disturbing trend, local governments passing laws restricting the sharing of food. Philadelphia and Houston are the two largest cities to recently propose laws restricting private efforts to help the hungry. Philadelphia announced today that it will attempt to stop people from sharing food with the hungry outside in parks. The city of Houston is considering passing their own law against providing meals to the hungry. While local governments are claiming they are seeking to protect the poor from unsafe food they are not able to point to one case where someone was made ill. Many of those depending on these meals will be forced to eat out of the garbage if the city is able to close these meals. Food Not Bombs provides some of the healthiest meals shared with the hungry. The food is often organic and is always low in salt, sugar and fats. People are also reporting that local police have stopped them from handing out food to the homeless often claiming that it is illegal suggesting that they could be jailed and fined. I was among 24 people arrested in Orlando, Florida in June 2011 for sharing meals to more than 24 people in violation of that cities large group feeding laws. I was held 17 days on my second arrest. I paid a $1,000 fine for my efforts. Many more people may be arrested and fined for helping the hungry and seeking to find long term solutions to America’s poverty. 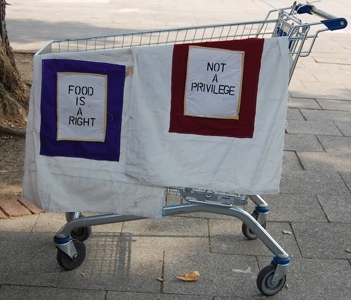 FOOD IS A RIGHT, NOT A PRIVILEGE – End all efforts to stop people from feeding the hungry.